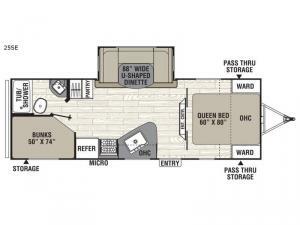 This Freedom Express Select 25SE travel trailer allows you to travel to your favorite destinations with plenty of room for the whole family and a few friends. Just imagine the kids laughing while laying on the double size bunk beds with their friends before bedtime. You can read a book or relax at the U-shaped dinette slide before heading to your own private bedroom in the front of the trailer. The rear bathroom is conventionally beside the bunks for the kids to have easy access at night. If you enjoy cooking, you will love all the appliances provided. Don't worry about storage, you will find plenty of space for all your things, even the larger camping items will surely fit in the pass-through storage. Take a look inside to see how perfect this model will be for your family!